Create customers letters to communicate with members. 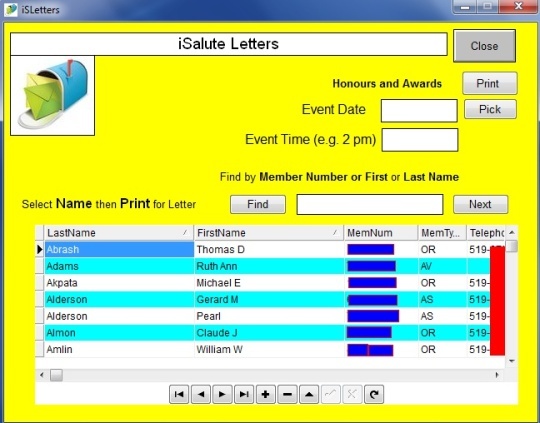 isLetters is add-on Software which allows individual Legion Branches to print custom letters of their choosing. For example, Honours and Awards Notification Letters. We develop up to 3 custom letters for your legion. You supply the text and we will send you the link to download the Setup program when we are done. Note: uses the database of iSalute Membership Software i.e. iSalute must be installed for this to work. Let me introduce you to my software. I approached RCL Branch 594 in Tecumseh, Ontario to ask if they used software to maintain their membership records. The answer was 'No'. So I offered to develop the software for their needs. After months working with the software helping out our membership chairman, I thought I should offer it to other Branches. (Update: I did such a good job I am now the branch membership chairperson so I use the software on a regular basis) Here is a picture of the Main Screen. Copyright(c) 2018 Computer Software Systems.